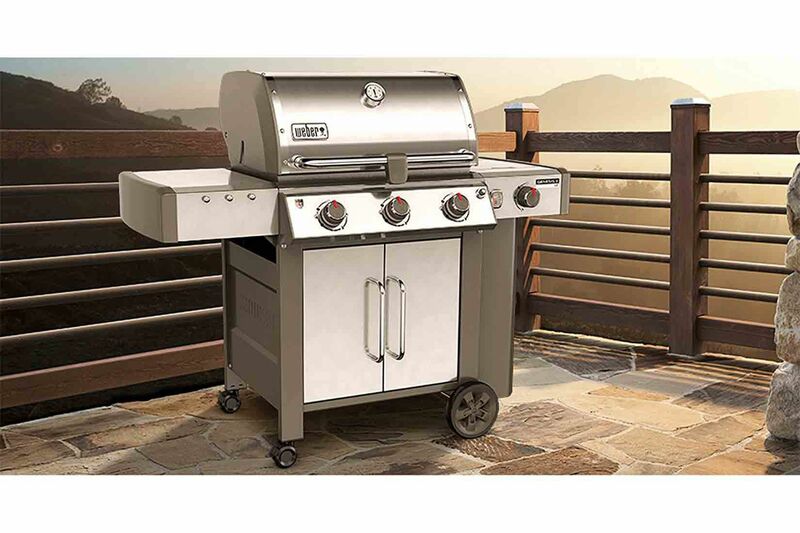 Gas Grills in this price range should be powerful, have good features, and quality construction. This doesn't mean complete stainless steel construction, but it does mean durable construction. Look for brand names and be prepared to look beyond the big box stores. Perfect for family dinners, this grill has 513 square inches of cooking space, plus an additional 156 square inches of space on the overhead warming rack that’s great for keeping foods at serving temperature or for warming buns for serving. Like other Genesis grills, this is designed with the GS4 grilling system, which includes four components: Infinity Ignition, high-performance burners, Flavorizer bars, and a grease management system. The Infinity Ignition provides easy, reliable grill lighting every time with the turn of a knob, just like turning on your stove. Three main burners provide a total of 43,500 BTUs of cooking power, while the side burner offers an additional 12,000 BTUs. Proprietary Flavorizer bars are made from durable stainless steel and help prevent flare-ups while creating the smoky flavor you’re looking for when you grill. For easy cleanup when cooking is done, the grease management system funnels away any grease that hasn’t been vaporized by the flavor bars. The cooking grates on this grill are made from stainless steel, so they’re easy to keep clean, they will never rust, and they provide even heat and impressive grill marks. The side table with integrated hooks give you space for plates, buns, condiments, grilling tools, and a beverage, so you won’t need to pull up an extra table while you cook. The side table folds down when not in use, giving you extra space in storage on the patio. The handle on the grill has an LED light that shines on the grill surface when the lid is lifted, so you can cook at night without needing a flashlight to check the temperature of your roast. The light turns off automatically when the lid is closed, to save power. The control knobs have their own lights, so you won’t need a flashlight to adjust the settings when you’re cooking after sunset. This grill is set up to use the iGrill3 (sold separately) that lets you monitor the grill temperature, food temperature, and fuel level remotely. This grill has five main stainless steel burners and dual chambers for cooking everything you want, with a total of 91,000 BTUs of cooking power. The stainless steel firebox and lid won’t rust or corrode and the 12,000 brass and stainless steel side burner let you simmer a sauce or cook a side dish. The grill also has a ceramic rotisserie burner that provides 13,000 BTUs of heat and a ceramic infrared searing burner that provides 16,000 BTUs. The cooking grids are wrapped with stainless steel that’s easy to maintain, and the even-heat system, enhanced grates, and angled flame tamers work to maintain even heat across the entire cooking surface. The main control knob lets you set low, medium or high temperature. The cabinet has shelves for extra storage space of your grilling gear, and the quick-start battery-operated ignition gets you cooking quickly. A grill cover and rotisserie kit are included. This is a powerful grill that delivers up to 48,000 BTUs under its 500 square inches of primary cooking area. This gives you the ability to sear and grill at high temperatures. The ability to lower the output to just 6,000 BTUs gives you a lot of versatility with this grill. The high quality of the internal components means it will last and perform for a long time. This grill comes with a 12,500 BTU infrared side burner and 19,000 BTU rear mounted infrared rotisserie burner and full rotisserie kit. Broilmaster P3S Super Premium Gas Grill. 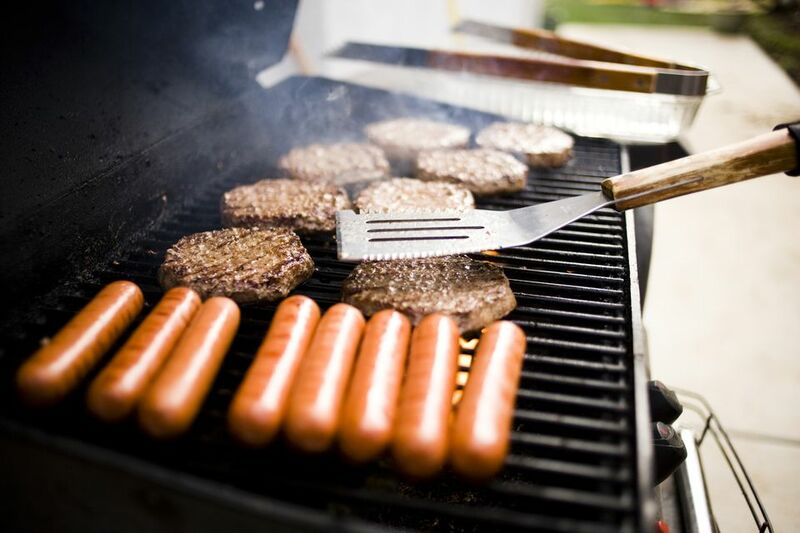 Empire Comfort Systems, Inc.
Long ago gas grills were made with cast aluminum bodies and quality, durable parts. Those grills, mostly gone now, where built to last for decades. They may not have been stylish or loaded with features but they cooked well and many are still around today. Broilmaster grills are amongst the few of these kinds of grills still in business. This grill, the top of the Broilmaster line is unique and built like a tank. This model has a unique shutter system that lets you switch from direct to indirect grilling with the flip of a lever. The cast stainless cooking grates can be set to three positions for temperature control. This 48,800 BTU gas grill offers 650 square inches of cooking space, five main burners, plus an infrared searing side burner and an infrared rear burner. The main burners are stainless steel with an individual ignition system. Flavorizer bars vaporize drippings to create the desirable smoky flavor while helping to keep the burners clean. A built-in thermometer makes it easy to monitor the cooking temperature, while the enclosed cart provides storage space for your grilling gear. Six tool hooks keep your tools at hand, and the light lets you see what you’re grilling once the sun goes down. A warming rack lets you toast your buns or keep food warm for serving. A rotisserie kit is included. Designed for a semi-permanent installation, this is a pedestal-style grill that should be bolted down for stability. Once installed, it won’t move if you bump it accidentally, or if the kids bounce balls off if it. This runs on natural gas, so it makes sense that you’d want it to remain solidly in place. The cooking grids are reversible and made from aluminum. One side has widely spaced ribs and thin ridges that are designed for creating grill marks on steaks, burgers​ and sausages, while the other side is flat for cooking fish, asparagus, or other foods that wouldn’t fare well on the ridged side. The dual H-shaped stainless steel burners heat the ceramic grill stones, which provide even heat and the smoky flavor you want from a grill. Two folding side shelves give you space for condiments, sauces, and tools while an integrated thermometer on top of the grill lets you monitor the internal temperature. A scraping stick in included to clean the grids since a wire brush is not recommended since it could damage the aluminum grids. The Holland Grill Apex Model# BH421SS5. The Holland Grill Co. The Holland Grill is a truly unique gas grill. This model, the Apex, is the top line product from Holland. To understand how different this grill is let me tell you that it has 330 square inches of cooking space, a single 13,000 BTU burner, a completely isolated cooking chamber, and a pair of smoke stacks on top. People who have owned this grill over the past two decades are dedicated fans that refuse to switch to a more conventional gas grill. On the other hand I know people who have found its unique and versatile cooking system difficult to get used to. Either way, this is a very well built grill. Blaze 32-Inch 4-Burner Gas Grill Model# BLZ-4-LP. Shopperschoice.com LLC. A commercial-style grill designed to be built into your home’s outdoor patio kitchen, this grill has easy-to-clean stainless steel cooking rods that will never rust and cast 304 stainless steel burners that are built to last. The lid is made from a double layer of stainless steel to protect the outer surface from heat discoloration, so it will look as good as new after years of use. When you’re cooking at night, interior lights let you see what you’re cooking, so you can keep making burgers well after sundown, and the knobs illuminate with red LEDs so you can check the settings easily. The flame-thrower ignition system gets the grill started easily, every time. When you want to cook steaks and fish, the heat zone separators will make sure you’ve got the right temperature for each, so you can sear your steak while the fish remains at a more gentle heat. Each of the four burners produces 14,000 BTUs of power, while the infrared rear burner produces 10,000 BTUs, and is perfect for us with the optional rotisserie kit, sold separately. The main cooking area is 740 square inches, and a removable warming rack is included, to keep your food at the proper serving temperature or warms your burger buns before serving. When cooking is done the full-width drip tray makes cleanup a breeze. Beefeater has been in the gas grill business for a very long time. This Australian company builds grills based on their unique take on grilling. This means that the burners are a little closer to the food than on many grills and the heat output is designed to cook hot and fast even with the lid off. In fact, this model of grill has an easily removable hood so that it can be opened up and approached from every side, making the grill the center of the backyard gathering. While not exactly innovative in appearance or function, the Beefeater Signature grill does exactly what it is supposed to. It grills extremely well with hot, even heat that makes this company one of the best in the world and one you have probably never heard of. This 5-burner grill has stainless steel cooking grates, a warming rack, a flame tamer and a stainless steel lid and liner. It provides a total of 84,000 BTUs of cooking power and 832 square inches of cooking space. The control panel has LED lights that make it easy to see in any weather and the temperature gauge in the hood lets you easily monitor the cooking temperature. The burners light individually with electronic ignition so you can cook on the full grill or select just part of the grill for small amounts of food. This also includes a cast iron side burner for simmering sauces and a warming rack gently heat foods or keep them warm while you’re waiting for the rest to cook. Two halogen lights make it easy to cook after the sun goes down, and a motorized rotisserie kit lets you cook roasts or chickens like a pro. Our reviewers spent 10 hours testing a top-rated gas grill between $1,000 and $2,000. They set it up in their own backyards, grilled a variety of foods, and cleaned it. We asked our testers to consider the most important features when using this gas grill, from its number of burners to its portability. We've outlined the key points here so that you, too, know what to look for when shopping. Number of burners On a stove, the number of burners indicates how many pots you can use for cooking at the same time. With a grill, the number of burners affects your ability to cook at different temperatures — plus, if you have more burners, you’ll also have more space for indirect cooking. Materials Grill grates are made from a variety of materials, including stainless steel and cast iron. Stainless steel has more longevity even though it can discolor from heat; and, over time, cast iron grates may chip or crack. Grill bodies are often made from stainless steel or coated steel. Again, stainless steel is very durable, while coated steel can offer you more color options and won’t rust as long as you take care of the coating properly. Portability How important is it for you to be able to move your grill? Even if you never plan on dragging it to the neighbors’ house to help with a backyard barbecue, maybe you’ll want to move it across your yard once in a while. If portability matters to you, assess a grill’s weight and maneuverability before buying. “This grill is easy to use, has very good temperature control, and easy-to-use knobs and lighting,” reported one of our testers. Other highlights, according to our reviewers, were that its design “looks great” and that the grill heats up very quickly. And like many of the grills we've tried before, the setup process was a bit complex. Our testers and some online reviewers thought that the instructions could have been clearer.